Carolyn J. (Doherty) Flaherty – of Woburn, January 17th, 2019 at eighty-two years of age. Beloved wife of sixty years of the late Albert “Jack” Flaherty, Jr. Devoted mother of A. John Flaherty III of Wakefield, Jane A. Flaherty, her companion Stephen Knight of Woburn, James E. Flaherty, his wife Stacy of Peabody, Paul A. of Medford, Peter T., his wife Sherry of Hampton and Patrick J. of Woburn. Cherished grandmother of Kelsey, Kara, Nicole, Skyler, James, Danielle, Jack, Cyrena, and Grace. Dear sister of Ann Marie Reardon of Medway. Also survived by many loving nieces, nephews, great and grand. A Funeral will be held from the Lynch-Cantillon Funeral Home, 263 Main Street, Woburn, Wednesday, January 23rd at 9 a.m. followed by a Funeral Mass in St. Charles Church, 280 Main Street, Woburn, at 10. Relatives and friends are respectfully invited to Calling Hours, Tuesday, 3-7 p.m. Remembrances may be made in Carolyn’s name to Multiple Myeloma Research Foundation, 383 Main Avenue, 5th Floor Norwalk, CT 06851, or to Winchester Hospital Oncology Department, 620 Washington St., Winchester, MA 01890. For directions, or to leave an online condolence, please visit www.lynch-cantillon.com or Facebook, under Lynch-Cantillon Funeral Home. Carolyn J. (Doherty) Flaherty passed away at her home early Thursday morning, January 17th, amongst her beloved family. Sadly, she was predeceased by her devoted husband John “Jack “ Flaherty just three months ago. Born in Boston, Carolyn was one of two daughters born to the late James F. and Ellen E. Ellis Doherty. Raised and educated in Jamaica Plain section of the city, Carolyn graduated from Jamaica Plain High School with the Class of 1953. Carolyn continued on with her education following high school at the Catherine LaBoure School of Nursing School, which was affiliated with the Carney Hospital, in Dorchester. Carolyn graduated from Nursing School in 1956, having become a registered nurse. During her time at Nursing School, Carolyn was introduced to a fellow classmate’s brother, at a beach party held at Nahant beach, Jack Flaherty! That was the beginning of a wonderful relationship from the get go. Then a year and a half later they married, which would have been sixty years, this past December. They settled right into Woburn settling in the Hilltop parkway section of the city. They brought six wonderful children into the world, in eight very short years! Jack worked as a teacher and a trumpet player, in his own band providing for all the “ extras “ for the six little ones! Their summers were spent at Hampton Beach were all the families would spend a lot of time, making some very cherished memories over the years. While the kids were in school, Carolyn was actively involved. She had served as President of the Woburn High School Band Guild, taking on the responsibilities of all their activities and fund-raising journeys. Their neighborhood was full of children, which led to many fun activities and over time, a lot of truly wonderful friendships for both the parents and children developed and have been lifelong! Carolyn returned to work at the Choate Hospital on a part time basis for a little over three years. 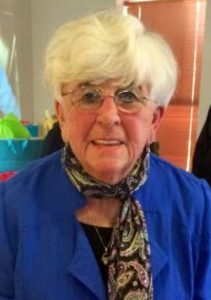 She then went to the New England Rehabilitation Center where she had served as the Nursing Supervisor and Educational Director for the last thirty-nine years. An exceptional Nurse, supervisor and teacher when it came to just about anything in the medical field. Right up until last month she had been teaching CPR courses at Winchester Hospital which she had been doing for over the last eleven years. It did not stop there either! Carolyn also served as a Nurses Aid Training Instructor, encouraging, teaching, training, and showing those who were interested in being involved in this part of the medical field, the best way things need to be done. And along the way came across a few individuals whom she encouraged to further their education, which they did, and been forever grateful to her for her recognition and encouragement. After the children were grown, she and Jack were able to travel more with family and friends! Planes, trains, ships and yachts, if it was going, they would make every effort to be on it. Cruises were a favorite, but going to Europe, Scandinavia, or Florida, they enjoyed every mile. Family and Faith were the two strongest areas throughout Carolyn’s life. She was so very proud of her children and when the grandchildren began arriving, her heart was bigger, from all the love she shared with them and they with her. An incredible woman who truly lived her life to the fullest, always in the moment, treasuring what God had given her, with a true, kind, genuinely beautiful spirit. All those lives she has touched over the years, have been changed forever. In addition to her beloved Jack, Carolyn was also predeceased by her parents. She is lovingly survived by her dear children; A. John Flaherty III of Wakefield, Jane A. Flaherty, her companion Stephen Knight of Woburn, James E. Flaherty, his wife Stacy of Peabody, Paul A. of Medford, Peter T., his wife Sherry of Hampton and Patrick J. of Woburn. Cherished grandmother of Kelsey, Kara, Nicole, Skyler, James, Danielle, Jack, Cyrena, and Grace. Dear sister of Ann Marie Reardon of Medway. Also survived by many loving nieces, nephews, great and grand. A Funeral will be held from the Lynch-Cantillon Funeral Home, 263 Main Street, Woburn, Wednesday, January 23rd at 9 a.m. followed by a Funeral Mass in St. Charles Church, 280 Main Street, Woburn, at 10. Relatives and friends are respectfully invited to Calling Hours, Tuesday, 3-7 p.m. Remembrances may be made in Carolyn’s name to Multiple Myeloma Research Foundation, 383 Main Avenue, 5th Floor Norwalk, CT 06851, or to Winchester Hospital Oncology Department, 620 Washington St., Winchester, MA 01890. For directions, or to leave an online condolence, please visit www.lynch-cantillon.com or Facebook, under Lynch-Cantillon Funeral Home. A Funeral will be held from the Lynch-Cantillon Funeral Home, 263 Main Street, Woburn, Wednesday, January 23rd at 9 a.m. followed by a Funeral Mass in St. Charles Church, 280 Main Street, Woburn, at 10. Relatives and friends are respectfully invited to Calling Hours, Tuesday, 3-7 p.m. Remembrances may be made in Carolyn’s name to Multiple Myeloma Research Foundation, 383 Main Avenue, 5th Floor Norwalk, CT 06851 or to Winchester Hospital Oncology Department, 620 Washington St., Winchester, MA 01890. For directions, or to leave an online condolence, please visit www.lynch-cantillon.com or Facebook, under Lynch-Cantillon Funeral Home. Jim and I were so saddened to hear of the loss of your mom/grandmother. We enjoyed talking with her on Hamilton Beach with her dear sister, Ann. Dear Jane, Kelsey, Kara….all brothers, wive’s, grandchildren, aunts, uncles, friends, co-workers….the list does not end – the list of everyone affected by Carol’s life. She certainly left a footprint, in the hearts and souls of all who knew her. She loved, lived and laughed. She helped us and taught us and stood beside us. She is alive in us all and will never be forgotten. Pain is what we feel when LOVE has touched us the way Carol’s did. She was an angel on earth and is now an angel in heaven – holding Jack’s hand and smiling down on us all. Peace and Love to you all. Carol was a wonderful and caring nurse. She influenced my nursing career in many ways. I had the honor to work with Carol at New England Rehab for many years. To the Flaherty family I am sorry for you loss. I will so miss Auntie Carol, she was like a 2nd mother to me, always welcome at the dinner table on Hilltop. She met every challenge with a ferocity that is so admired. Rest in peace sweet woman. Our deepest sympathies to the entire Flaherty family. Carolyn was an amazing woman, nurse, and neighbor. She will be missed dearly. Our thoughts and prayers are with you at this time. I’m so sorry to hear about your mother. I hope you can all find some comfort from cherished memories and the support of your family and friends. A light has left this earth…….and took a piece of our hearts with her. Love you dear friend………..forever remembered…..forever loved. Paul and I spent many days on several cruises with Carol and Jack. We have wonderful memories of those precious times. I had the opportunity to work over 24 years with Carol at NERH where she taught me so much as a mentor. We shared stories about our families and she always could be counted on listen and care. I will miss you!